Our autobody shop can repair anything from small scratches to major damage, even damage that insurance companies consider a total loss can sometimes to repaired economically. We can repaint entire vehicles. We have different tiers of pricing depending on the quality required by the cutomer. 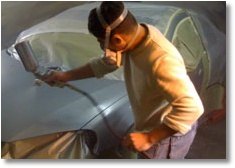 From $500 full paint job to $10,000 show class paint jobs, we do them all. Sometimes we can even pay your insurance deductable, so that you will not be out of pocket. 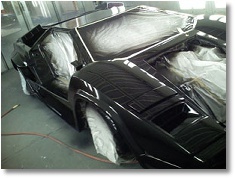 We also specialize in fiberglass and gelcoat repair, or custom paint jobs. Our full detail service for just $149 includes:- Buff, wax, exterior. Steam clean interior, steam clean and shine engine. Clean and treat wheels and all trim inside and out. We also have an ozone treatment for odor removal that also fully disinfects and sanitizes the interior of a vehicle.